What a beautiful turbulent sky! Thank you for the introduction to Holly Hughes. I will look her up. When I enlarged the photo, I thought the clouds looked like gray taffeta: dull but shimmering, all at once. I thought the poem shimmered a bit, too. As if there weren’t a J. in the middle of her name: it might be for the joy strewn all around. I’m not surprised to see that, like you, she has spent a long time working on the water. Her work was new to me, but I was drawn to it immediately, just as I was to that of Dillard, Oliver, and Wendell Berry. Part of the attraction was my sense of familiarity with those last words. I wrote much the same thing two years ago, also in a poem. And also with an unusually early appearance of a wildflower. The mind never wants to stop! This poem paints a good picture of its eagerness — or Type A behavior! — and the occasional blessed respite we can get. Thank you! The poem is evocative in so many ways, isn’t it? I thought of you when I paired the image and the poem, given your recent musings about your reading and your walks under leaden skies. Sometimes there’s great pleasure in days that aren’t stereotypically beautiful, just as there can be great wisdom in unpopular and unheralded books. The poem is very true, and your photo is mesmerizing! I love the photo. It’s proof that a gray sky can be intricate and lively — it doesn’t have to have that sodden, wet blanket look! And now I need to go back and look at your photo of the workers’ collective again. There may more tentative light there than I first noticed. Your comments on the Russian photo were insightful, and they added an important perspective to the discussion. I’m glad you wrote them. It’s a good example of something I’ve come to believe: that reality’s usually both/and rather than either/or. As thoughtful as I’ve come to expect from you. What a kind thing to say. It’s interesting — I’ve had this photo of the sky tucked in the midst of a hundred blazing sunset photos, wondering if I’d ever find a use for it. Asked, and answered. I ditto ‘eremophila’s statement. You raise the bar, Linda. As long as that bar doesn’t collapse on me, and as long as I don’t start doing pull-ups with it and strangle myself (there’s a sixth grade memory there), things will be just fine. Beautiful image. My eyes and mind delighted in “the grey porridge of clouds”. Any day with porridge in it is a joy to me. But, of course, I always want more. I have to know: what is your ‘porridge’? Oatmeal? Cream of wheat? I assume you’re not breakfasting on the original Pease porridge, . If I were, I’m not sure I’d want more, unless there wasn’t anything else in the larder. I do love this image. I mentioned to Lavinia that it looks to me like gray silk taffeta when the photo’s enlarged. I love oatmeal porridge.That is my usual porridge. But I also love semolina porridge and cornmeal porridge. Pease porridge, or versions of it, is a rare item in this household. And I agree that your image is more like gray silk taffeta than porridge. When I was growing up and reciting the verse, I always thought it was “peas porridge.” I didn’t learn about Pease porridge until relatively recently. I’ll take oatmeal with blueberries and cinnamon, thank you very much. I think I thought it was peace porridge! We could all use a bowl of that! I’ve seen skies like that at the lake — and the poet is right. We stare at it and love it and appreciate it — but we want one more day with another like it! Have you been to Jean’s blog yet? She got caught by that ice storm in the western part of the state, and is out of her house because of no heat or light. She’s hoping the pipes don’t freeze. The poem evokes both the everyday, mundane of life, but also the transcendent. I’d say the photo does the same; it’s a treat that both artful expressions manage that, but you clearly felt it too. So beautiful. Our gray skies so often are flat and featureless. The play of wind through these clouds was unique, and it stirred them up nicely. Sometimes, I see the clouds themselves as swallows playing in the sky; I suppose it’s that V-shape. I think the poet stitched the mundane to the transcendent wonderfully well: as well as the osprey stitching the sea to the sky. Pouting….great thoughts, but we can just recite and look on the bright side just so many days, right? Misty cold dog walks today, but at least not rain! Very cool photo, to me it looks like dye dropped into water. I know what taffeta is, my sister had a dress of that for a prom or some sort of formal, that’s also a good comparison. Boy you have a good eye, or I guess, ear (heart?) for picking poems, I like this one a lot. The thought of dye never crossed my mind, but now I can see it. I use an old piece of china as a pen holder, and when too much ink’s collected in the bottom, I use denatured alcohol to get it out. When I pour the alcohol in, it pulls the ink out of the porcelain in swirls much like these clouds. I especially liked the poem’s image of a “slat of sunlight.” That’s just how it often looks here at the end of the day, or after a storm — except we can’t tilt the blinds to brighten the day. Oh, isn’t it just human nature to want more. No matter how much we have. I love the contrary sky. I spent a long moment trying to scope out how those clouds worked, the weird diagonals. It almost looked like ink in moving water. You’re getting quite good at this photography thing. What a perfect phrase: a ‘contrary sky.’ That’s true in at least two ways: this kind of sky is contrary to what we generally prefer, and the darkness and light also work in opposition to each other. 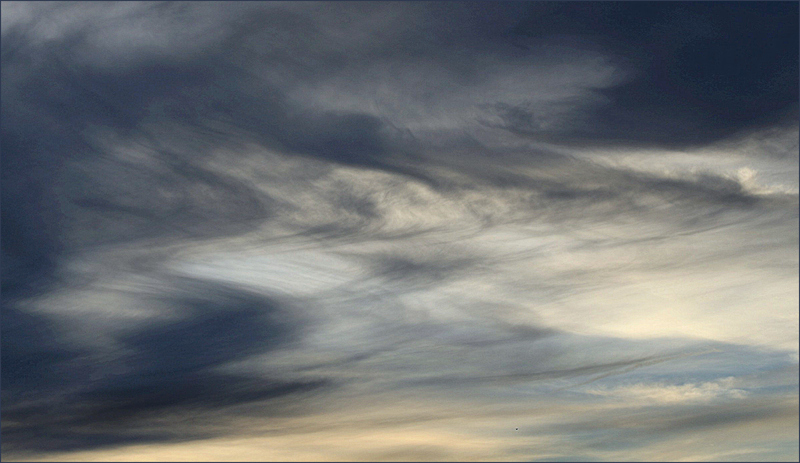 The patterns are unusual, and quite different from the gray skies we usually get, which are either stormy or leaden. One thing I have noticed about my photography skills is that I’m getting more comfortable with the camera, and can respond more quickly when I spot something — a cloud formation, a sunset, a hovering insect — that isn’t going to hang around for more than a few seconds. I still can be bumbly, but I don’t have to wonder quite so often which setting I need to change. Perhaps every writer can identify with this line: “one more hour to get the words right,” huh, Linda? I’m assuming this is one of your recent skies. Looks like changeable weather ahead. I hope you’re moderating a bit from the chilly blast — we’ve got a few more days of it, sad to say! Right now, most of us down here don’t want one more hour of sunshine — we want any hours of sunshine at all. It will come, but we’re back in the fog again. It’s the price of warming up — all that warm, humid air over cold water. I suspect you’d take warm and humid, and be happy. Too bad we can’t all have seventy five with sunshine and a light breeze all the time. That sounds heavenly — when you find a place like that, sign me up to relocate!! Sometimes I begin with a photo, and look for a poem to go with it. Other times, I find a poem or something else I think worth sharing, and go through the archives looking for a photo. But no matter how it develops, it’s always a pleasure to achieve a good pairing. I’m glad you liked this one! There’s the message! Wonderful. And the photo – just beautiful, and perfect with the poem. When I first read your post about ‘keeping the dark,’ I smiled, because I’d already pulled this photo from the archives to use. It really is a fascinating sky: not as easy to interpret as standard cumulus or cirrus, but perhaps even more interesting. It’s always intriguing to me when photo and poem intersect so mysteriously well. To read about a “beige slat of sun” and be able to say, “Why, yes. I have a photo that shows that” is just a little — something!